To honor the 48th anniversary of the release of Arthur P. Jacobs production of Franklin J. Schaffner's film PLANET OF THE APES, Pithikos Entertainment is proud to announce the release of a New Digital Recording of Jerry Goldsmith's landmark score! This project, more than two years in the making, is a logical extension of the work author, musician and recording engineer John O'Callaghan did for the acclaimed book Simians & Serialism. While in no way a substitute for the original recording conducted by Jerry Goldsmith and performed by Hollywood's finest musicians, this new Digital Recording makes this legendary score come alive again. It demonstrates for the listener that Goldsmith's serial compositions are more than mere "movie music" and deserve a place among the defining works of twentieth century orchestral repertoire. 12-page, full color booklet with an essay on the album's production, photos of Emil Richards' unique percussion instruments in action and more! An exciting CD for any fan of Jerry Goldsmith, Planet of the Apes or twentieth century serialism, be sure to purchase your copy today while supplies last! Ordered. If its pota,star trek, classic BSG, or Bond music, its ordered. Excellent! Very excited to hear this new recording of one of my favorites from Goldsmith! Appears to be an extremely exciting recording of one of the greatest musical works of the 20th Century composed by Jerry Goldsmith. I would have preferred a real orchestra, however I will save my judgment until I actually have it in hand. John: your book is stunning, and I'm sure this album will be too. Congrats! I recently watched the film and noticed how different the film mix sounds from the existing CD. I wonder if this new recording will have the presence of the film mix. The presence I'm more concerned about is the non-presence of a real orchestra. I don't feel any need at all for a version with a VST/synth "orchestra" when a good recording of the truly orchestral soundtrack is readily available. I'm afraid I'm personally no more attracted to it than I would be to VST/synth renditions of the scores for Ben-Hur, The Blue Max or The Sea Hawk. This is so weird. It's so weird! The smaller ensemble stuff sounds far more successful than the action material. Interested in the 24bit / 88.2kHz files. Will this album be available to download as well? I may be prejudice, since this is my all-time favorite score, but anyone who complains that this re-recording hasn't been preformed by an actual orchestra needs to know that this is an extremely hard score to do. Maybe not ALIEN hard, but very difficult just the same, especially if you're going to try and sound anywhere near the OST. A symphony in London tried it last year and I heard that it left a lot to be desired. I've never heard any orchestra do any cue from this film that met with my satisfaction, has anyone else? And for any and all who'll dismiss this effort simply because they can't stand VRT or "synth" orchestral stuff (You know, like Jerry's HOOSIERS score! ), please do me and even Mr. O'Callaghan a huge favor and write or email Robert Townson at Varese Sarabande and remind him that PLANET OF THE APES 50th anniversary is just two years away and wouldn't it be nice to restore and remaster the original soundtrack recordings. Thanks. Agreed. Some of the tracks sound astonishingly like the original soundtrack in higher quality. Truly a remarkable achievement, that. And yet some of the clips sound a bit like synth mock-ups of the score. I'm buying this anyways as I think it's a fascinating experiment by one of our own, and these type of ventures need to be supported. Furthermore, as a massive fan of the score, I know I'll get something out of this release - if nothing else, it'll be a great companion to the OST, illuminating details that may be hidden in the less-than-stellar mix. Ordered, along with the book - the high shipping rate to Canada made me skip the book, but bundled together, the shipping is much more reasonable for the two items; great idea. Looking forward to listening and reading. You see, I don't get it. On the one hand a lot of effort has clearly gone into replicating the original score exactly. The same tempo, the same orchestration, the same percussion instruments. Words like "precise" have been thrown around. But on the other, one of the most striking things about the score (and something Goldsmith was always quick/proud to point out) is that it is fully acoustic (this is not Hoosiers!!). What's the point of having a perfect percussion section if the rest of the orchestra is missing? Of course it's difficult to play, and orchestras are expensive, but that's no excuse to "cheat". As I suggested in the other thread, a collaboration with James Fitzpatick on this could have yielded amazing results. This feels more like an exercise in technical wizardry than a legitimate film music recording. It's too slavish to be a new interpretation, yet too sythetic to be a satisfying recreation. Bravo for your obvious love and dedication, and I'm sure many will like it, but despite being a Goldsmith completist I may have to pasis unfortunately. I highly recommend the book though! Seminal score such as this deserved better... perhaps one day it will be done right, until then it's easy to pass and save 36 USD it would cost. 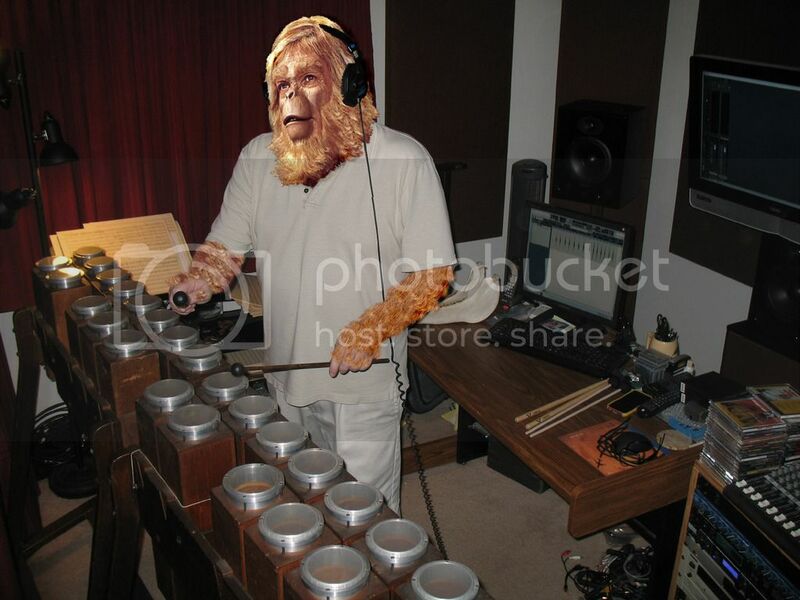 Having recorded a suite from Planet of the Apes with live orchestra quite a few years ago including Mixing Bowl....yes it is difficult music but actually not overly difficult for real orchestra to perform....and actually great fun to do.